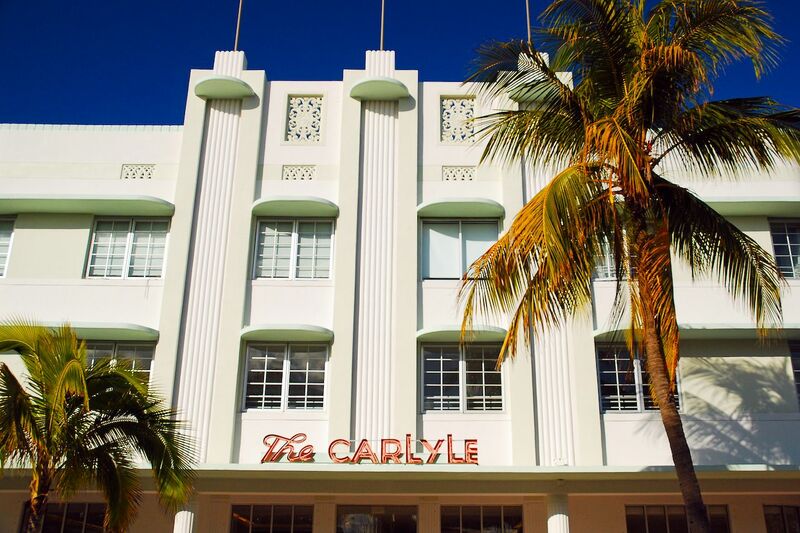 Art Deco style may have debuted in Paris, but its migration to Miami during the 1930s means that Florida’s seaside hotspot is now home to one of the world’s largest and most well-preserved collections of Art Deco architecture. Miami’s take on Art Deco (dubbed “Tropical Art Deco”) maintains the style’s signature devotion to straight lines and its geometric interpretation of nature but incorporates its own flair through the use of nautical elements and colorful pastels. 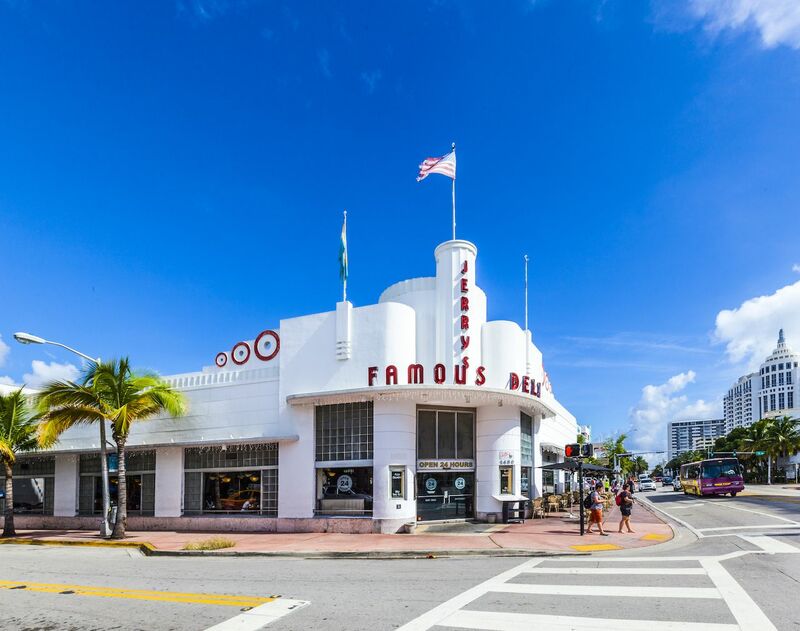 There are more than 800 Art Deco buildings in the city, but because checking all of them out would require you to explore Miami’s every nook and cranny, we selected 11 of them for you to get a start on the city’s emblematic architectural style. 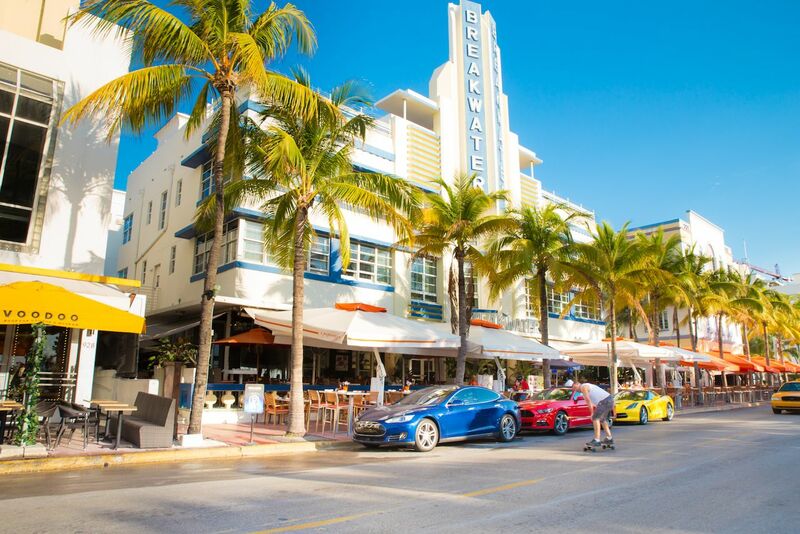 We also suggest that you enjoy the candy-colored painted exteriors by day, and go again when the sun’s set because many of the Art Deco hotels along Ocean Drive glow with bright lights — a sight that will transport you right back to the golden age of neon. 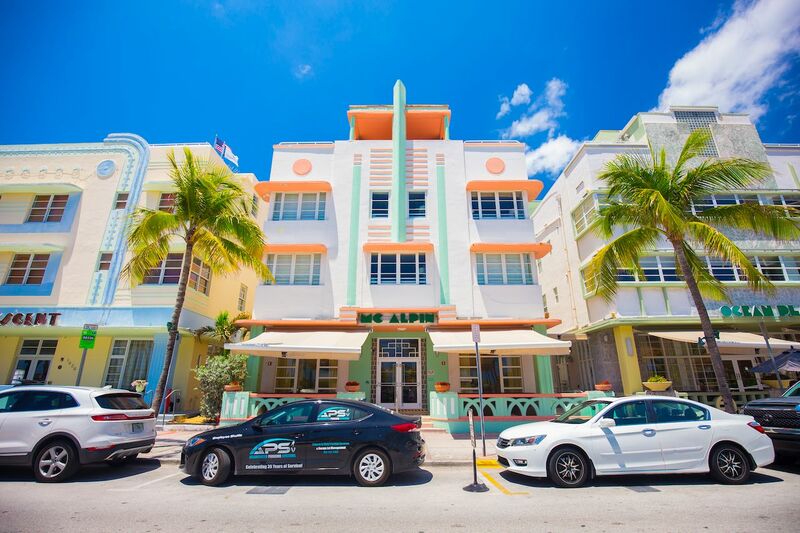 Symmetrical and perfectly pastel, the McAlpin is one of the best examples of Art Deco architecture in Miami. 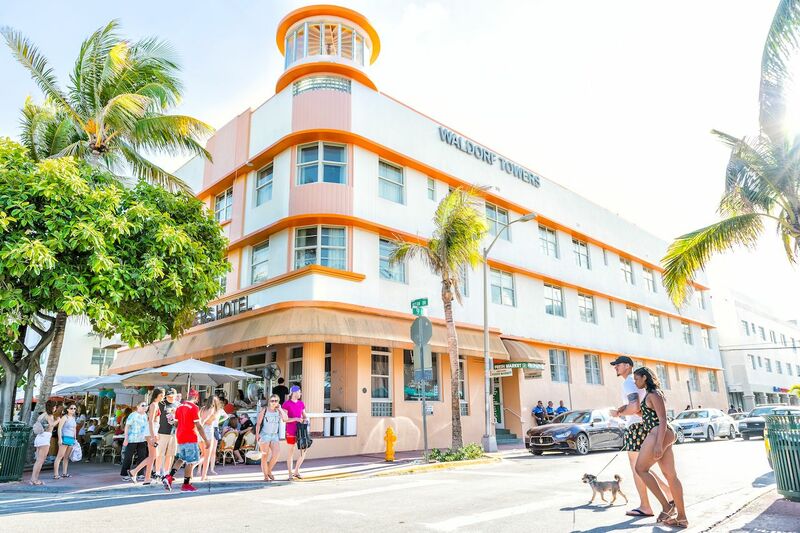 It was designed in 1940 by Lawrence Murray Dixon and even today is one of the most popular (and most photographed) buildings on the South Beach stretch. The hotel, now owned by Hilton, remains open for reservations for the ultimate Miami Beach stay. A nightlife hotspot, hotel, and icon of South Beach, the Clevelander was built in 1938 by famous architect Albert Anis. Today, some of the best partying in the city can be found at this historic spot; the Clevelander has a nightly schedule of live entertainment on the outdoor poolside patio, including live DJs, fire shows, and go-go dancers. Things may get a little wild, and you have to be 21 to even be allowed to stay at the hotel. 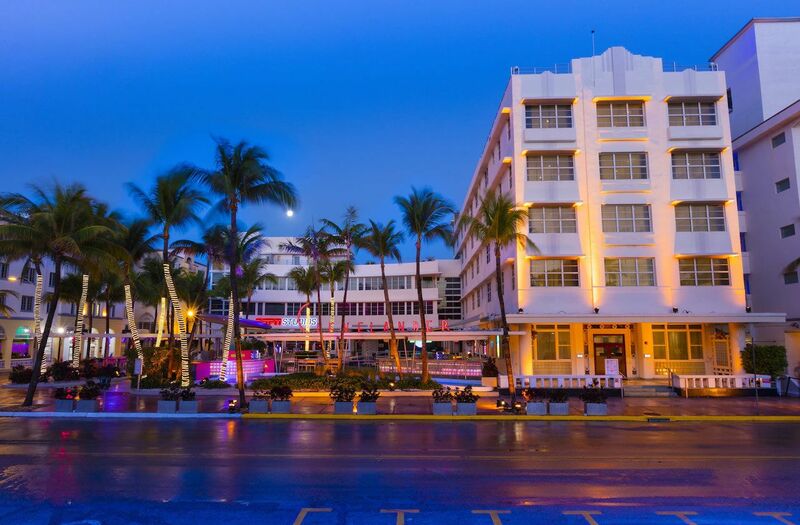 Colorful and covered in neon, the Breakwater Hotel is a perfect example of the nautically-inspired touches of Art Deco that are unique to Miami. It resembles a ship setting sail into the Atlantic Ocean that it faces. Amenities available to guests of the Breakwater Hotel’s 99 rooms include a sidewalk cafe, rooftop bar, and glass-sided aquarium-style swimming pool. 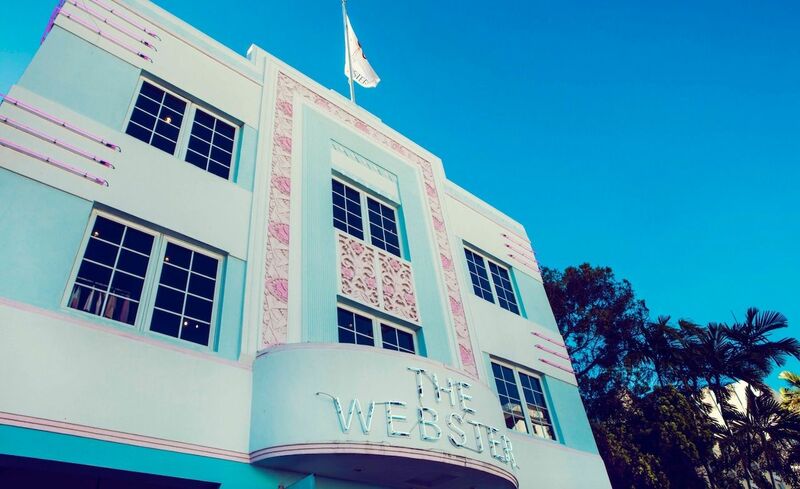 Dating back to 1939, The Webster perfectly captures the spirit of Miami with its straight lines, ornate carvings, and neon accents. Its design was conceived in the mind of famous architect Henry Hohauser. Formerly a hotel, today it remains in business as a high-end, multi-brand fashion boutique. The building is three stories tall and even has a rooftop deck for visitors to enjoy. Clad in bright orange and topped with a pillared cupola, the Waldorf Towers Hotel is a real looker. Now under the Room Mate Hotels umbrella, the Waldorf Towers Hotel has been completely renovated but still holds to the original design by Albert Anis — and, most importantly, still overlooks the Atlantic on the world-famous Ocean Drive. The Carlyle stands out amidst the South Beach skyline with its soft white and seafoam green coloring. The building dates back to 1941, when it opened as a hotel. If you’re lucky, you may still get the chance to spend a night at the Carlyle; today, it stands as both a hotel and residential condos. Another design by Henry Hohauser, the old Jerry’s Famous Deli is nautical and eye-catching. Though it opened in 1939 as a cafeteria, it has since been a home for clubs, a bar, and a ballroom before transforming back into an eatery in the form of Jerry’s Famous Deli. In 2014, the building permanently closed again and currently lies in wait for a tenant that will breathe new life into the historic spot. The Colony Theatre opened in 1935 as a movie house for Paramount Pictures and continues to entertain patrons to this day, though now it presents performing arts and live acts such as concerts, comedies, and operas rather than movies. 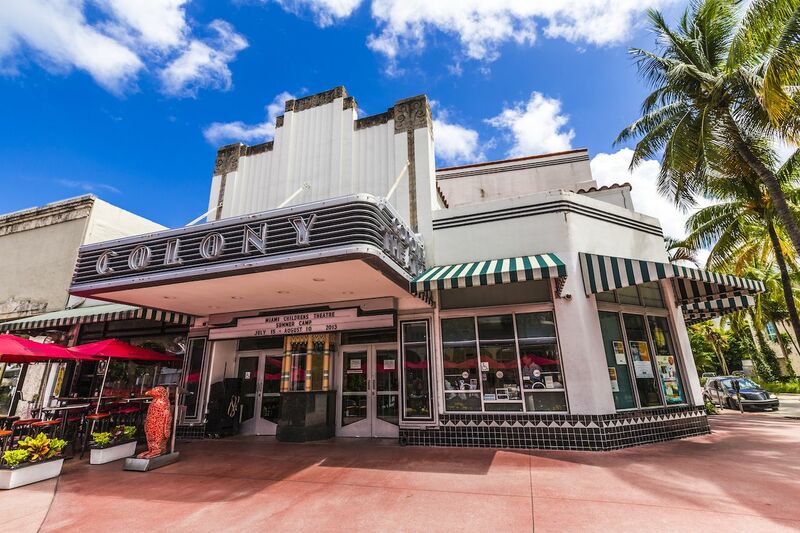 From the terrazzo floors to the ticket box, the Colony Theatre has undergone renovations to preserve its Art Deco design through the ages. Constructed to resemble a car, the oceanfront Cadillac Hotel features chrome trim, soft colors, and even a hood ornament. Built in 1940, the building was designed by Roy France and remains open to hotel guests to this day, though it has since been purchased by Marriott as an addition to its Autograph Collection line of distinguished hotels. Marriott made some changes to the design, but kept the overall Art Deco look of the building. 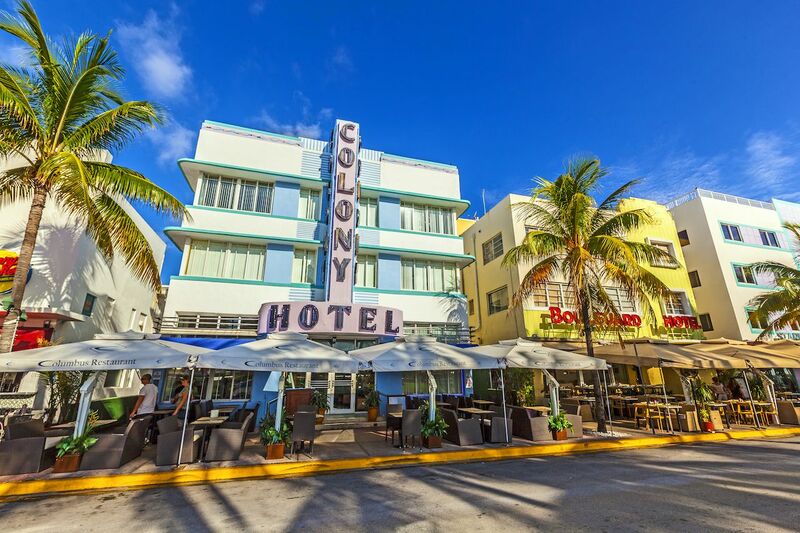 Captivating during the day, the Colony Hotel truly comes alive — bedecked in glowing neon colors — at night. Illuminated in electric blues and bright purples, the Colony Hotel stands like a beacon in the night. 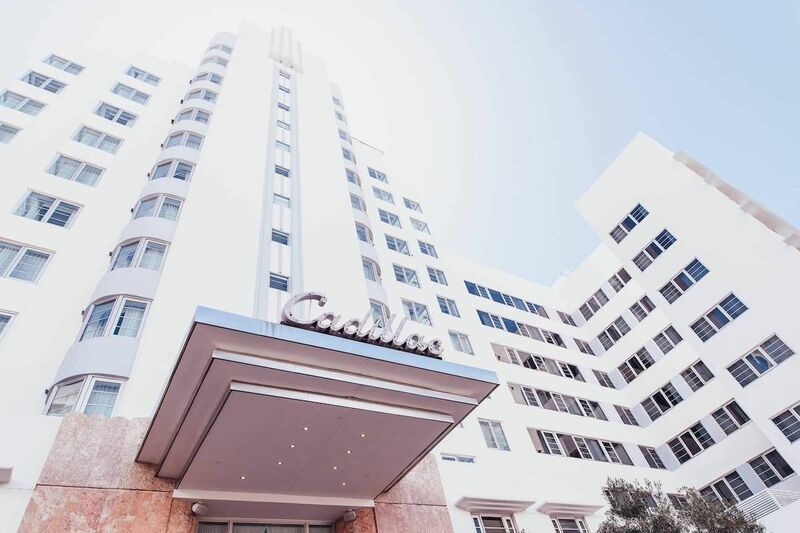 “Recognized around the world as the undisputed symbol of South Beach,” according to the hotel’s website, “the Colony Hotel in Miami Beach has set the standard for hospitality and style since 1935.” Best of all, the interiors have been maintained to complement the building’s Art Deco exterior. Upon first glance at the Delano South Beach, you’d never guess the building was originally constructed to serve as military housing. At the time — the building was constructed in 1947 — the four-winged tower was the tallest building in Miami. Today, celebrities rather than soldiers flock to the Delano, now a part of the Morgans Hotel Group, for a little rest and relaxation. Fun fact: The hotel is named in honor of US President Franklin D. Roosevelt.